Although it is a post war description, enthusiasts and modelers alike know what you mean when you are talking about a 'razorback' P-47. These are the initial run of aircraft until the more widely used 'bubbletop planes came into production in 1944. It was these early planes that introduced what was then (and now) a huge single engine fighter into the USAAF. There were several reasons for its size, the main ones being the need for a robust airframe to handle the power of the R-2800 radial, space for the turbocharger, and a large enough wing to house the eight fifty caliber machine guns. Later, the aircraft was also strengthened to carry stores under the fuselage and the wings. It was this ability to carry so much that made it a superlative fighter-bomber, but that is not for which this plane was designed. Indeed, it was to be a standard air to air fighter, and despite was was a rather dismal climbing ability, the plane was not only successful as an air to air fighter, but also was able to absorb a considerable amount of damage, something its pilots came to appreciate once they flew it in combat. In common with other books in this series, one can basically divide the book into two major sections. One is history and development of the aircraft, which includes those built in Curtiss. This section is crammed full of great photos (many of them color), color profiles and some color art work. This includes a small section on warbirds and other survivors. It also briefly touches on those planes operated by other nations. The second part of the book is more detailed and is on the airframe and systems of the P-47. This makes copious use of photos of both warbird and museum aircraft along with period images and tech manual illustrations. 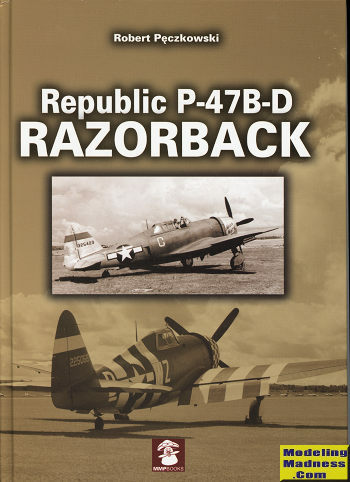 As an interesting side note, there are two currently flying razorback P-47s detailed in the book. Both are Curtiss built P-47Gs, a type that pretty much was kept in the US for training. Some of the detail structure images are on aircraft undergoing restoration, so it is nice to be able to see this sort of detail. One of the restoration images seems to have the fuselage bulkheads and stringer held together with metal braces. Apparently this is one pulled from the jungle or sea that has seen better days! In all, it makes for an outstanding reference for any Thunderbolt enthusiast and some great reading and eye candy for the rest of us. It is a book that is well worth obtaining and is one that I have no trouble providing my highest recommendation. Most aviation buffs are familiar with the Republic P-47 Thunderbolt. Then there are those of us die-hard fans that have a disproportionate amount of shelf space devoted to books on Kartveli's masterpiece: The Jug. I'm one of those. That being the case, I jumped at the chance to review the new book by Mushroom Model Publications that focuses exclusively on Razorback versions of the P-47. The book begins with a comprehensive developmental history of the P-47 starting with the short-nosed B model through the C series, the early D series, and lastly production of the P-47G Razorback by Curtiss. Use of the Razorback by foreign countries such as China and the Soviet Union is discussed, as is use of Thunderbolt Mk. I Razorbacks by the RAF. This section is filled with crisp WWII era photos, schematics, and 30 beautiful, color drawings by Zbigniew Kolacha. Of note is a color drawing of the captured P-47D-2 that served in the Luftwaffe Zirkus Rosarius. Of real value to the modeler is the chapter entitled "Detail Photos" which is divided into subsections each focusing on a specific portion of the airframe (fuselage, wings, engine, cockpit, canopy, tail, undercarriage, guns, and stores). I really like the way this section of the book is laid out as it features ample schematics and drawings from P-47 maintenance manuals along with WWII era photos and pictures of restored airframes. Neat! This is another great offering from MMP. The extensive selection of pictures and schematics will provide most modelers all the information needed to build a super detailed Razorback. Thanks to Mushroom Model Publications for the review copy. Authored by Robert Peczkowski, with color profiles by Zbigniew Kolacha, this book, is a comprehensive text and photographic/image guide to the Republic P-47B-D. The book thoroughly covers the “B”, “C”, and “D” versions of this famous World War II aircraft. This story is told in excellent text, accompanied by period B&W photographs, excellent color images of surviving airframes, extracts from official manuals, and a superb collection of color profiles by Zbigniew Kolacha. Of particular interest to the hobbyist is the excellent color artwork which depicts many of the camouflage schemes and markings found on the P-47. Of particular interest in the list of chapters are those which feature “Detail Photos” of the fuselage, wing, engine, canopy, cockpit, tail, undercarriage, guns, and stores. The modeler will find these images rich in detail. A video featuring the book is available for online viewing on YouTube at http://mmpbooks.biz/ksiazki/312. During this nine-minute video, each page in the book is shown, and it demonstrates just how rich this book is in detail, reference material, and imagery. This book is highly recommended due to the detailed text, excellent and multitudinous color images, and collection of historic B&W photographs. Thanks to Mushroom Model Publications for the opportunity to review this excellent book.